These words had been spoken countless times by my husband and I over the past ten years. Although we’ve always liked our friends' dogs, we’ve never considered ourselves animal people, and with providing foster care to countless children over the years and now taking care of our own four little people, the timing never seemed right to have a dog. All that changed over this past Christmas break. Our daughter Jasmine has always been drawn to animals, particularly dogs. There is something soothing for her about being around animals. As Christmas break approached and I attended her conferences, her teacher showed me a report Jasmine had spent hours on about a dog named Goose. And while her teacher thought it a rather funny name, I knew immediately that Jasmine was referring to the fun-loving dog who lives on my aunt’s farm. Then, on New Years Eve, we enjoyed the holiday with friends who have a couple of dogs. Jasmine spent most of her time with the dogs—playing, petting, and just loving on them. Kyle and I were struck again by how being with animals does something for Jasmine, how it calms her and comforts her in a way that little else does. The next day we started looking for a dog. And all I kept thinking about as we researched dogs and sent messages to breeders was: This isn’t about spoiling my daughter or giving her everything she wants, it’s about offering her any comfort I can that will help her feel loved and whole. That is why, a few days later, Kyle and I found ourselves driving to a breeder an hour or so from our house to pick up a dog neither of us ever fathomed we’d own. It’s why I now stand outside at 1 am on a cold Minnesota January night encouraging this same puppy to relieve itself so we can hurry back inside. It’s why I tear up when I see my girl snuggle her puppy while he sleeps and think there isn’t anything I wouldn’t do for this kid. And it’s why I am so amazed as I consider that this is how God approaches us, too, offering us comfort and love when we need it. Giving us everything we need to feel whole. Not that he always gives us everything we want, but that he offers us something so much better -- giving us what we need in the form of peace or love or joy or faith. 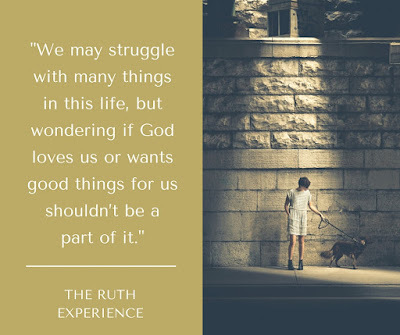 We may struggle with many things in this life, but wondering if God loves us or wants good things for us shouldn’t be a part of it. This is what I’m praying Jasmine will grow up and know for herself -- that she had parents who loved her enough to give her the things she needed to be the healthiest version of herself and to see the God who also wants good things for her reflected in our simple acts. Today we are linking up once again with Holley Gerth and Jennifer Dukes Lee. Joy, thank you so much for sharing! I love that your word this year is love! I think it's something we all need to remind ourselves of on a regular basis. I'm so glad you stopped by today. Blessings to you! Such a beautiful story! I love that your daughter is comforted by animals! Love this! Such a sweet post! So precious! I am from Minnesota and sooooooo know the sacrifice of letting that puppy out on those cold Minnesota winter nights! That is LOVE! Yes! Another Minnesota girl! Thanks for stopping by! "Not that he always gives us everything we want, but that he offers us something so much better." Exactly what I needed to read right now, thank you! !